Alan Cohen's wisdom continues to inspire me after years of hearing excerpts from his books on the "Dave 'til Dawn" show. Every time Dave Wingert would read a quote or passage it would be exactly what I needed to hear. 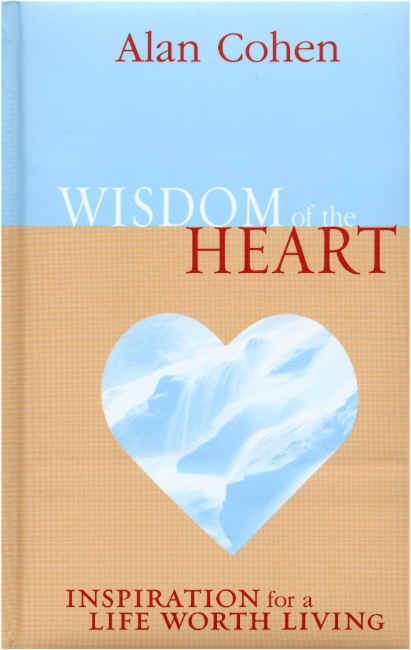 Finally, I decided to read all of Alan's books and thought I should start with "Wisdom of the Heart." Alan Cohen's message accesses a deep place of peace and can calm a troubled heart. His insight and wisdom will resonate with your core beliefs, no matter what religion you espouse. If there is a battle between your head and heart, this book will quickly remedy any doubts and will foster an environment in which you can escape the tyranny of the mind. Through aphorisms, lessons, poems, quotations, humorous stories and parables, Alan provides a calm environment in which you can reconnect with your heart. Unique quotes and passages from Anatole France, Theophane the Monk, Parker J. Palmer, Rumi, William Shakespeare, D. H. Lawrence, William James, Piet Hein, Walt Whitman and Albert Schweitzer made this book quite interesting. Especially since these were not quotes you would find that easily. There are also many stories that are part of oral traditions passed down through generations of storytellers. Each chapter begins with a story or poetic quotations and then Alan provides a few paragraphs of insight. There are 52 selections. You can read one a week or devour them all in a single sitting. I enjoyed this book so much, I seriously could not stop reading and the pages kept turning. Many of the stories have humorous endings. This book will also heal with laughter. I loved the story about "Caller I.D." in which a mystery is solved and two people find their soul mates. Then, in "Smoke Signals" we find that in the irony of life, our problems can be solved by what we first assume is a tragedy. In "True To Yourself" Alan shows how we can follow our unique path in life and reap the benefits of perseverance. Alan Cohen has a unique style of writing. He is able to condense profound thoughts in a minimum of sentences. He speaks directly to your heart. I found his lyrical style comforting and healing. "Wisdom of the Heart" will lead you to a place where your heart will open and your mind will submit to a new place of calm. Alan is a "truth finder." If you are seeking, this is a book where you will find a place to set down your depression, discouragement and failures in the past. "Wisdom of the Heart" shows you the beauty of the "Cosmic Coincidence Control Center." It guides you to the path of a success thinker and gives you permission to follow the path your heart will love. Through Alan Cohen's books I've learned a lot about myself and quite a bit about life itself in all its highs and lows. Alan seems to encourage me to look at life as more of a challenge. He sees humor and lessons in situations that would cause others to sink into a deep depression. He has a secret way of looking at life that he reveals in his caring way and wise contemplations. At the start of this book he lists dynamic ideas to open your heart and mind and then he delves into an almost autobiographical essay. If you are interested in how Alan started his journey, then this particular book will reveal his initial interests, his yearning for a connection with the Divine and how he sought out various books and teachers to guide him in his spiritual quest. This book is divided into two sections: The Journey and The Homecoming. Alan talks about how he visited a Zen monastery, became interested in Ram Dass and Jesus' teachings and worked in a Seven-Eleven type store. He finally meets a spiritual teacher named Hilda who has a profound effect on his life. There is an intimacy in Alan's books that mingles with humor and spiritual healing. It seems that when I'm feeling sad, Alan's books either make me laugh or help me to release my negative emotions in tears. So, either way, the reading of The Dragon Doesn't Live Here Anymore helped me fight off a few angry invisible dragons. There are nice dragons too, I think. Those are the dragons that love to fly across the October moon and enjoy seeing their shadow floating across lakes. After reading this book, you may want to watch the Dare to be Yourself video or look for additional books. When I read Alan's books, I seem to wake up the next day high on life itself. There is an energy in his books that makes me want to write! Alan Cohen has the almost god-like ability to see good in even the most trying of situations. He may have in fact perfected the art of Wabi Sabi living as described in a book by Taro Gold of the same name. I have never ceased to be amazed at how Alan Cohen can see good in even the most devastating emotional situations. He is truly a survivor and life can rarely throw him a challenge he can't handle. If you are going through a divorce, considering a divorce (especially if you have children), are in the middle of a breakup or even just ending a relationship with your significant other, then this book may be a helpful guide leading you towards greater happiness instead of unending self-defeating patterns. While it is almost impossible to see the good in a breakup if you want to stay in a relationship, there is something to be said for a gain in the area of self-esteem if you find yourself free to look for someone who will treat you with more respect. The list of common ways we distract ourselves from emotional pain made sense to me. They are probably the same ways a person could escape from depression or dealing with life's everyday problems. Denial, blaming, guilt and addictions are discussed briefly and there are real-life examples throughout this amazing book. First, you realize you do have the power to love, even if you don't have the power to maintain the relationship that is dissolving. To love a person who has rejected the very core of yourself is probably the most difficult thing you will ever have to do besides deal with the death of a person you love. Staying friends with your ex? How? Apparently it is possible and can be accomplished by allowing yourself to move through the various stages as you move out of a deeply involved lover relationship and turn a lover into a friend. Imagine an author who is able to find the opportunities gained in a situation where your heart has been broken. In this discussion of "staying friends with your ex," Alan Cohen also gives lists of the wrong reasons couples get together in the first place. This could be helpful as you seek a different partner. He delves into post-breakup scenarios, meaningful breakup rituals, communication issues, transitional relationships and how to communicate through a brick wall. I do have to make one comment in regards to knowing when it is time to not maintain a friendship. When the person is abusive, it might just be time to end the relationship and find the love and support you crave in a more nurturing environment. Often, God will send angels to lead you from a bad situation to a place of healing. By being patient in the cycles of resting and renewal, we can then grow in spiritual ways we never imagined to be possible. Chapter 9, Good-Bye for Good is a chapter that could bring healing instead of discord. I think this is possibly the most helpful relationship book Alan Cohen has ever written, although I still have a few more books to read. The section on the Power of Thought is an excellent way to send love to those who are far away. I found page 159 to be especially healing and that one page is worth the price of the book.